Virgin solvent for all dry-cleaning. You may be surprised to discover that many local dry-cleaners do not clean and preserve gowns in their shops, but send their customer’s bridal gowns out to wholesale dry-cleaners. 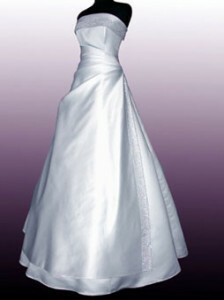 Wholesale Dry-cleaners wedding gown cleaning is usually in large quantity, as many as thirty gowns at once. Very little attention is paid to individual gowns. But here at Heritage Garment Preservation, we our wedding gown cleaning is done one by One. We would love to give your wedding gown the attention it deserves. Read our comprehensive Wedding Gown Preservation Guide. Read about our special care of Silk Wedding Gown Cleaning. Read about our special care of Polyester Wedding Dress Cleaning. Heritage did an excellent job cleaning my daughter's all lace wedding dress. They were able to remove all the spray tan stains and the dirt under the train. It looks beautiful. They kept us informed every step of the way. I feel like they treated the dress as if it were their own. Service from order until delivery was excellent. They really took good care of my dress. They did a great job at repairing the few things that ripped during the wedding and removing all the stains. It was definitely worth the price. Two years later and still Beautiful! I definitely recommend this service for any wedding dress. My dress was homemade, made from old cotton table runners and table clothes. I used the "Heritage" Garment Preservation to preserve my wedding dress. We have been married two years and my dress still looks just as amazing now as it did on my special day! And that is saying something! Because for the cake cutting my husband and I basically threw cake at each other. The cake got all over the front and inside of my dress. "Heritage Garment Preservation" was able to remove all the stains and smudges along with makeup, pollen from my bouquet, and smudges from dirty hands from my dress. It wasn't harmed and still looks beautiful. Thank You!! !